While we teach our children that we must not hate people, we also must teach them to loathe injustice, evil, prejudice, and the mistreatment of the weak. 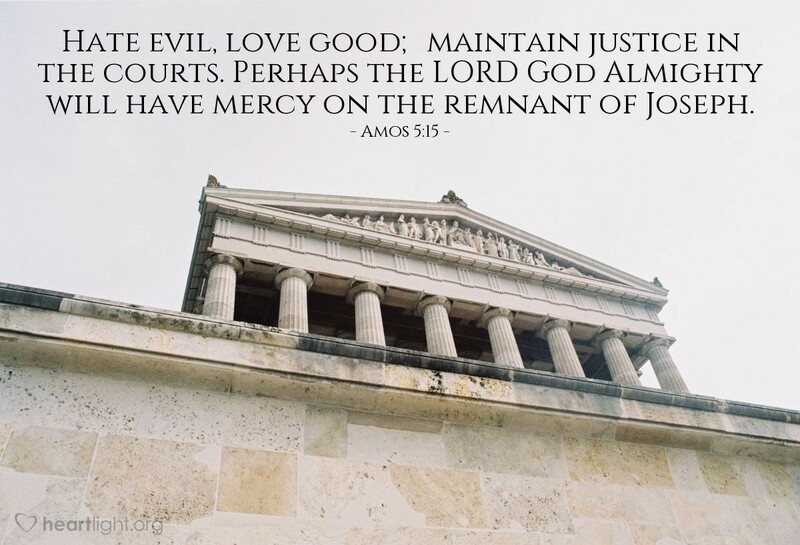 Amos reminded Israel that God demands justice to be administered fairly for both rich and poor, resident and alien. Their repeated refusals of God's will in these areas brought destruction upon their land despite their apparent affluence and power in Amos' day. Holy God, I know you are furious at the injustice in so many lands and are enraged at the ethnic hatred setting our world ablaze. Please make your people, your Church, a place of justice, equity, compassion, love, racial healing, and hope. Please begin in my heart and with my hands to build this better world. In Jesus' name, I pray. Amen.